Backtracking a bit, we parked the car in a lot across the street from this übercuteness. I'll be saying that a lot, so bear with me. 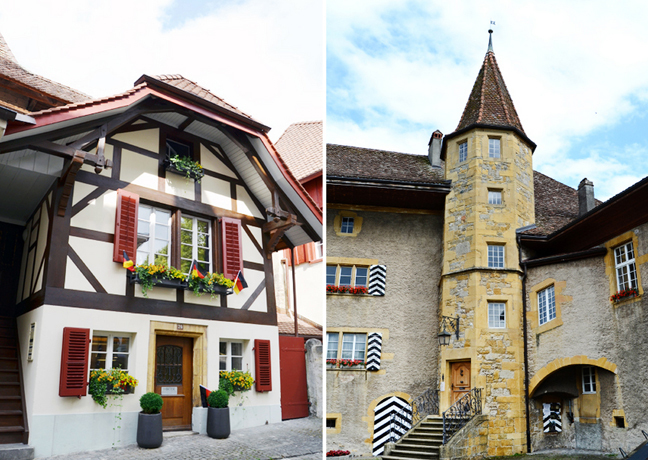 Murten is totally endearing with lively arcaded streets, breezy outdoor cafés, and elegant shops. 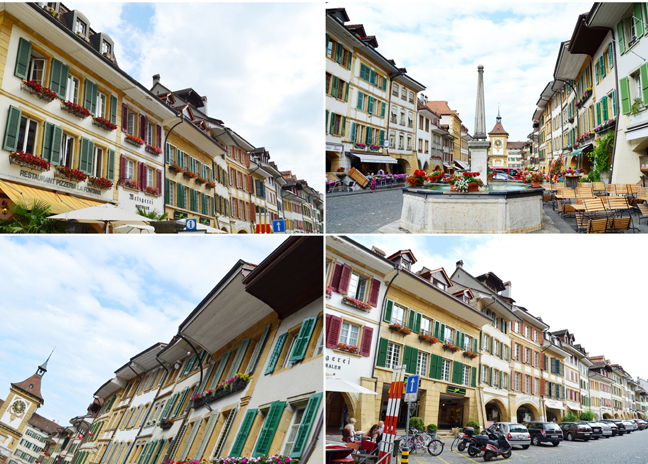 Our self-guided walk began just below the town's main gate. Rather than passing through the gate we took a little detour around the wall to see the cannonballs still stuck in place to remind townsfolk of their incredible victory over the Burgundians - like an Alamo with a happy ending. We strolled up the wall along the lakeview terrace. Across the way is Mont Vully (mohn voo-yee) - one big vineyard. The lowlands to the right - a rich former lakebed - are the heart of the fertile Three Lakes Region (lakes Biel, Neuchâtel, and Murten). The lush farmland is called the "vegetable garden of Switzerland" for its soil which yields more than 60 varieties of produce. The ancient Celtic Helvetii tribe recognized the fertility of this land and settled here. The Romans likewise made this land a priority in establishing their colony of Helvetia. We checked out the small French Church from the outside. And passed the cannonball wall once more. 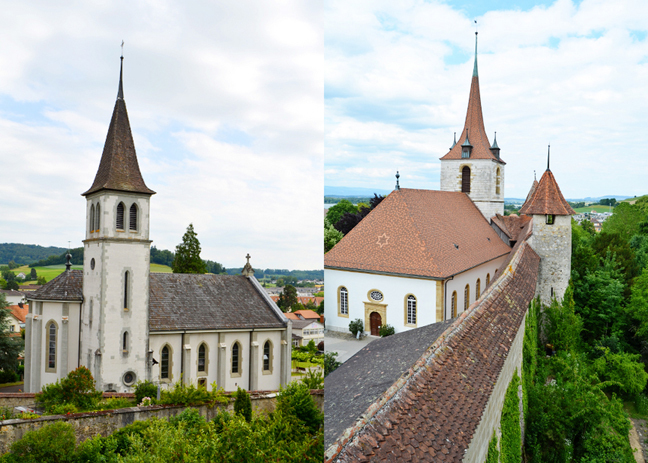 Foreseeing a showdown with Burgundy, Adrian von Bubenberg had the town walls strengthened. As 3/4 of the townspeople were German-speaking they took a vote and decided to tear down the French church to get more stones. This little church (visible through the massive tree below) was rebuilt for the French-speaking community six years after the big one was demolished. 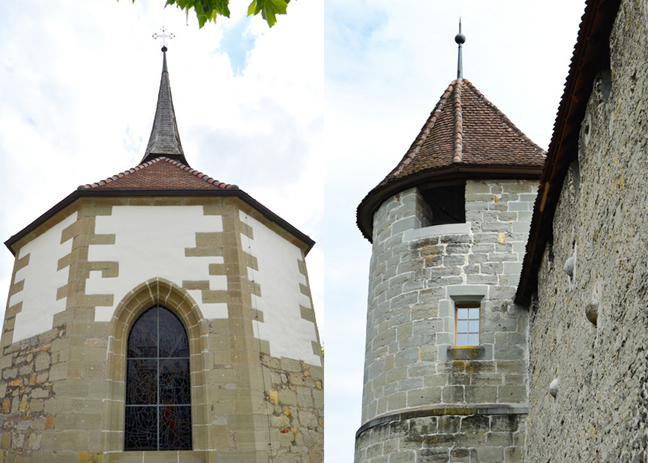 As the Calvinist Reformation swept through Catholic Switzerland in the early 16th century churches like this were stripped of their rich paintings, sculptures, and stained glass. Elaborate altars were replaced with simple, Bible-topped tables, and pulpits became the focus. The emphasis was teaching the word of God. In this church about the only exception to the "no distraction" rule are the tiny stained-glass coat of arms - heraldry of the wealthy families who helped fund its construction. OMG could this place BE any cuter?!?! We passed the Bibliothek - the library is also a Ludothek which means that parents can check out toys and games for their children rather than spend their hard-earned money on keeping massive places like Toys "R" Us in business. What a novel idea! It would be so great to just rent toys instead of buy them. 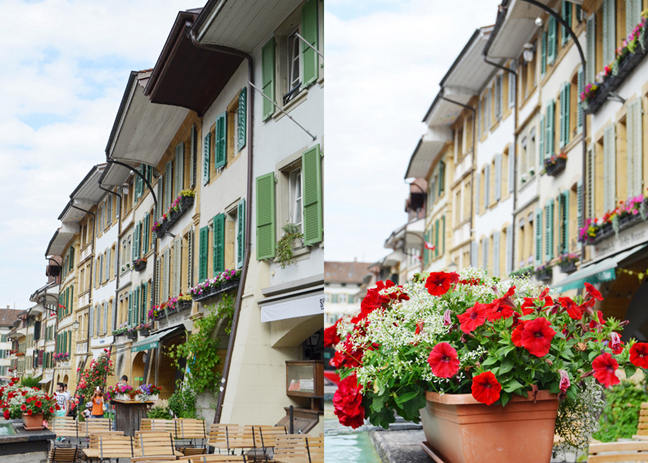 Around every corner and turn were more picturesque houses with flowers galore. SHUTTERS! I think that's what makes this town so unique and adorable. Painted shutters! Around the corner is the German Church built in 1710. 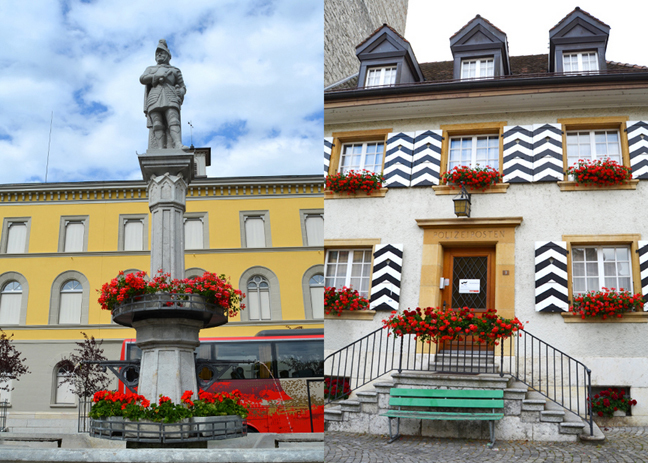 As the town is on the border between two cantons (Bern and Fribourg) for 400 years its rule was shared: every five years it would flip between cantons. Arrangements like this didn't sit well with Napoleon and around 1800 he made it firmly a part of Fribourg. We wanted to go in but a concert was just beginning which we were able to hear when we were up on the wall. Free music! Limestone and sandstone tombstones on the side of the church. | Checkerboard roads, "so cute!" Around the back of the church is access to the ramparts. Looking down the empty wall. I love feeling like we're the only people there. Telephone and electricity wires are all underground which makes the town look so clean! Imagine the action on June 22, 1476. Mighty Charles the Bold with his 20,000 well-armed Burgundians was camped on a hill opposite here for 10 days, laying siege to the town of 2000. Runners were sent out from the town to gather help. A makeshift army of about 10,000 villagers gathered on hills to the left. Just as George Washington attacked when the Redcoats were celebrating Christmas, the Swiss swooped in as the Burgundians were still hungover from a big Midsummer Night's Eve bash. The Battle of Murten was fought in pouring rain - a muddy, bloody mess. Almost all 20,000 Burgundians were slaughtered - many driven into the lake with their armor on to drown (try swimming in a coat of mail...). For centuries French bones would wash ashore. Charles the (no-longer-so) Bold barely got away on a very fast horse. This victory demonstrated to the Swiss the advantages of E Pluribus Unum and the assemblage of the many still-fiercely independent Swiss cantons into the Helvetic Confederation snowballed. In this sweet little corner an influential battle in European history had been fought. Burgundian power ebbed, and Europe got to know a new nation... Switzerland. Outside the wall is lush and green and open. Inside the wall is cramped and cozy! Church outside the wall. | The German church we just came from. Someone's garden. Love it to pieces. Statue of the feisty town hero - Adrian von Bubenberg. Burgundy was the aggressive power of the day and this Murten native stopped the power grab of the 15th century by beating Charles the Bold. Adrian von Bubenberg stood here and looked across the lake at the distant peaks of the Jura Mountains - the historic border between the Swiss and the French. | Former prison turned police station. Cutest police station I've ever seen! We walked back to the deliriously adorable main street and let the kids play in the fountain for a bit. 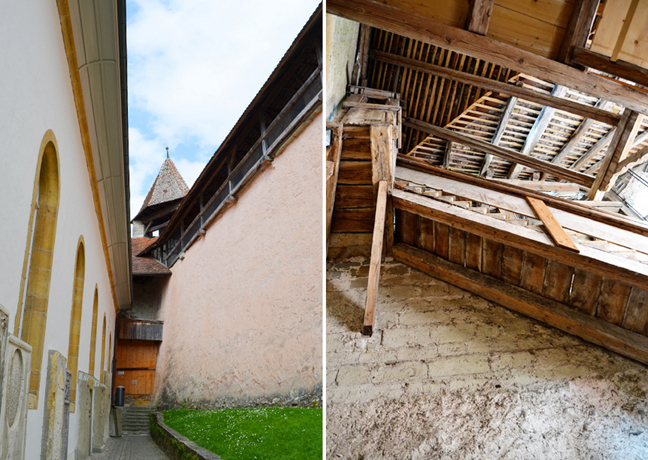 At the top of town we found the Murten Castle. Cool beans. Couldn't go in, it was closed but fun to see from the outside! Flowers and painted shutters oh my. Get it? Got it. Good. We walked through an alley filled with antiques. Be still my heart. We walked down the main street one more time to take it all in, wished we could stay, or rather, live here, and then headed back out the gate to our car. 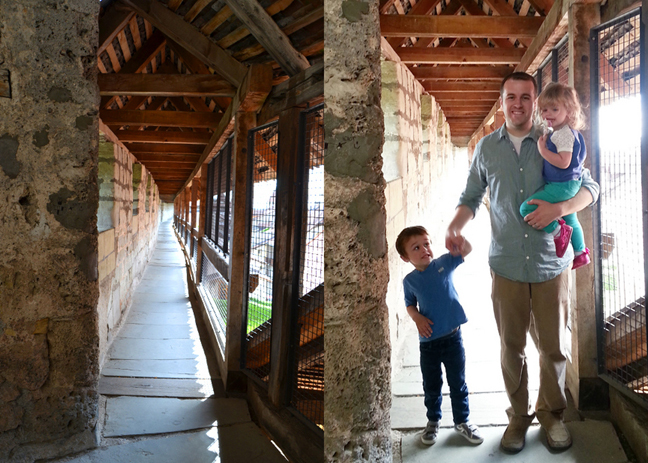 We read about Avenches in our book and decided to check it out before going back to the apartment for the night. 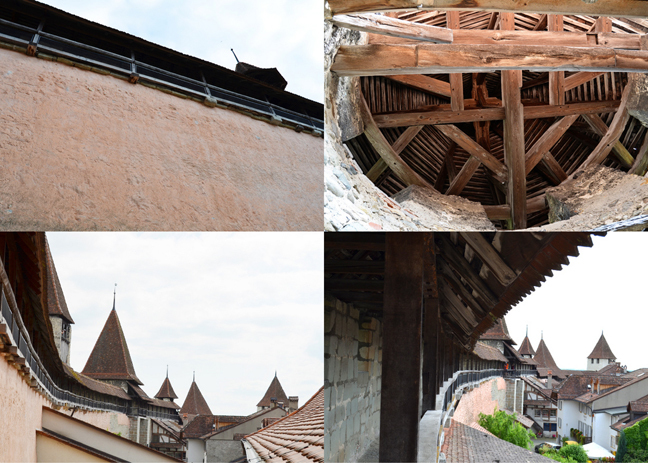 Avenches - four miles south of Murten - was once Aventicum, the Roman capital of Helvetia with a population of 20,000. Today it's a quaint little town with an ancient theater. Romans appreciated its strategic crossroads location, fertile land, and comfortable climate. While the population today could barely fill the well-worn ruins of their Roman amphitheater, Aventicum was once one of the largest cities of the Roman Empire. Everything sits on Roman ruins which were nearly quarried to oblivion over several centuries; the scant remains were finally spared in the 19th century and today, things are carefully preserved. 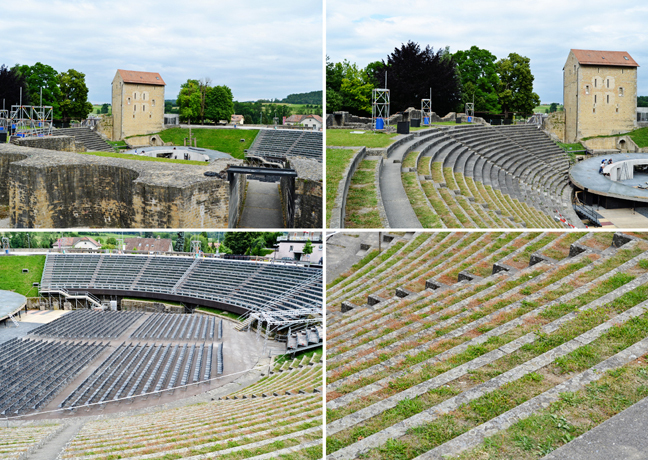 The amphitheater, or arena, which once seated 18,000, is the largest Roman ruin in Switzerland. Although the gladiator action is no more, it's still busy with an annual opera festival and other musical events. We only saw a tiny part of what looked to be original, the rest is new. Still cool. There are other ruins scattered around town, but we took a raincheck and headed back to our apartment for dinner. Wow!! You're right!! I could TOTALLY picture Belle walking through that town with her nose in a book! LOVING all the photos!!!!! I'm singing, "There goes the baker with his tray like always. . . " What a cute little town. Some Disney location scout must have vacationed there. gorgeous! thanks for sharing these!